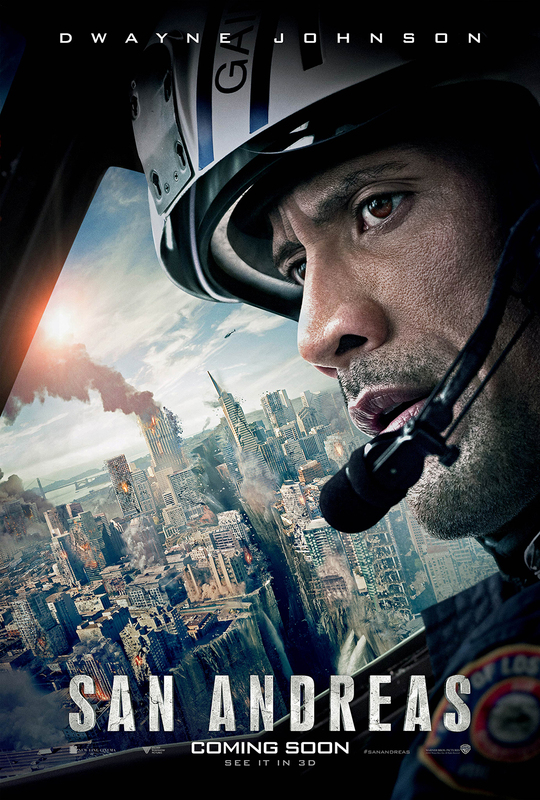 After the infamous San Andreas Fault finally gives, triggering a magnitude 9 earthquake in California, a search and rescue helicopter pilot (Dwayne Johnson) and his estranged wife make their way together from Los Angeles to San Francisco to save their only daughter. But their treacherous journey north is only the beginning, and when they think the worst may be over… it’s just getting started. For those who had studied Geography, they will remember that San Andreas Fault, a famous tectonic boundary with a few notable earthquakes in historic times. Gone were the days where audience are satisfied with olden day star wars effect. Having to make a film about natural disaster and making it realistic was the one thing I was policing on. I wasn’t disappointed. Although there were certain crazy scenes like driving the speedboats against the tsunami current, and the visibly green-screen filming when Ray (Dwayne Johnson) and his wife Emma (Carla Gugino) were navigating the boat through the destructions, the special effects were outstanding and impressive. However, the relationship between the cast failed to impress me. Dwayne Johnson and Carla Gugino played a couple on the verge of divorce going on a mission to locate their daughter in the midst of the disaster. The portrayal of estranged relationship was passable (I prefer the Rock in action) or perhaps subtle, and it is perhaps the best as compared to the rest. Ben (Hugo Johnstone-Burt) and younger brother, Ollie (Art Parkinson) plays the brothers from United Kingdom, looking for a job in San Francisco when the earthquake took place. While there were’t much chance for them to do their brotherhood stuff, I thought Art Parkinson did a good job transforming from a cheeky younger brother asking contact on behalf of his brother to a scared boy who is scared to die. Yes, so Ben likes Blake (Alexandra Daddario), Ray’s daughter and it was a love at first sight. This type of mushy plot is usually my favourite, but here, it completely didn’t make any logical sense. Who in the right frame of their mind will save a girl trapped in an underground carpark single-handedly (and even brought his younger brother along) when the building was on the verge of collapsing? While that proved to be a correct choice in the end, the little loopholes made the film a tad too dramatic to be real. P.S. Watch out for Will Yun Lee who plays Dr. Kim Park, a Caltech seismologist. Although he played a small supporting role, I’m really like his performance. Although they play a father and daughter, there is only a 14 year age difference between Dwayne Johnson and Alexandra Daddario. Check out San Andreas Official Website and Facebook Page! San Andreas is out in cinemas on 28 May 2015.
this movie makes us all be cautious on the possibilities that we may encounter in the future. disasters like earthquakes has been happening all over the world now and primarily in Asia.which is really terrifying. I went to see this and LOVED it. I’m usually not a fan of these type of movies but I was pleasantly surprised that I loved it as much as I did. I have to watch this. It’s nice that the cast did all their stunt as this says about the dedication of the team. Nice review dear. Have seen this film just the other night. Quiet impress but so exaggerated those quake scenes. Too good to be true. While some parts do look too green screen made, i love how the director really wanted the cast to do their own stunts! This might just be a must watch movie. Is going to watch it. Thanks for the review. I love this kind of action thrilling movie. I have a phobia watching the disastrous movie, as if it might happen and some did happened. I heard some good reviews about this movie. I watched this movie with excitement. American film have much to be trusted in making big-budgeted movie. Too edgy for more actions! I have seen San Andreas and I was pretty much holding on to the edge of my seat the entire time. I’m planning to read about the reality of how this could happen in real life. The movie had an effect on me ( more of concern ) because our local news are always reporting about the West Valley Fault. This film was really timely. I haven’t seen the movie, so I really can’t tell. I seldom go to movie houses and I just usually wait for the DVD releases. Wow this sounds great. I love adventure style films. Definitely one we will be looking out for. great review. I wanted to watch this when I saw Dwayne on the poster (haha, bias me!) but after watching the trailer, I decided not too. it feels really OTT and unreal….